The Cinematic Schematic returns with a roundtable review and breakdown of Marvel Studios newest film, Black Panther. Today’s panel consists of The Cinematropolis film critic and Cinematic Schematic host Caleb Masters, the writer/director of You People, Laron Chapman, and first-time guest Joshua Unruh from Pulp Diction Productions. In this discussion, we give our initial spoiler-free review followed by an in-depth spoiler discussion about the film’s plot, character arcs, and larger themes. Black Panther is written and directed by Ryan Coogler and is the eighteenth movie set in Marvel’s Cinematic Universe, but the first to star a person of color. 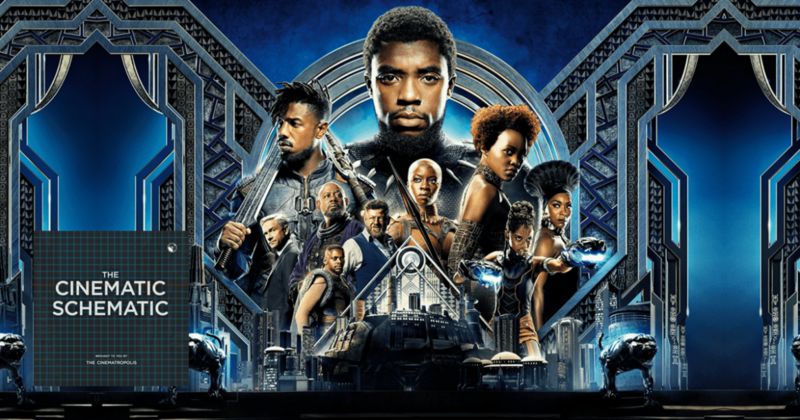 The film features an incredible cast including Chadwick Boseman, Michael B. Jordan, Lupita Nyong’o, Angela Bassett, Forest Whitaker, Daniel Kaluuya, and Andy Serkis. Disney and Marvel seem to have fully committed to the film but being the eighteenth entry in this long-running series, does the change of perspective shake things up enough to stay fresh? Tune in to hear our reviews, recommendations, and analysis of the film’s presentation of racial politics.